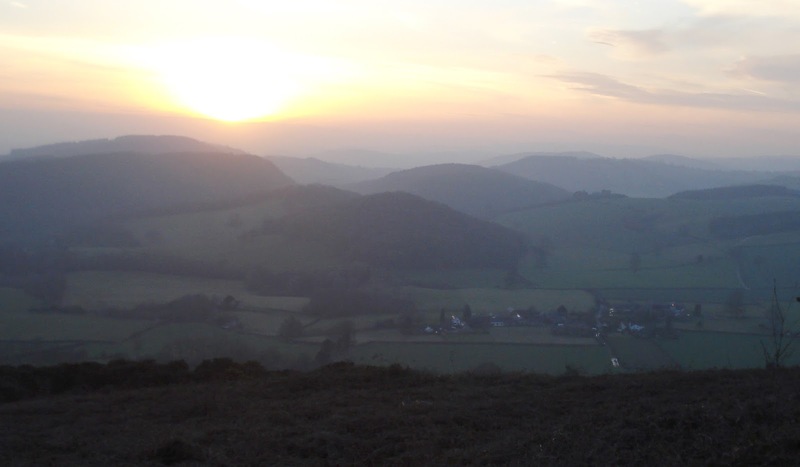 In about half an hour the sun will set behind the haze covered Welsh hills to the west of Croft Ambrey. Compared to yesterday’s almost blizzard like conditions up on Stow Hill near Knighton, the sunshine today was quite warm in those places sheltered from the cold breeze. I have spent the day walking meditatively around the walled garden at Croft Castle, Fishpool Valley and the woods up to Croft Ambrey. Just a slow relaxing plod looking at everything around me and enjoying a day when the sense of spring was tangible in the landscape. I could have stopped to draw so many times but my senses are just overwhelmed at being outside in a place I love. I just wanted to walk and sense everything around me. This is all a distraction from the whirl of work and deadlines. I can drift away from the demands of modern work life and sit, stand or walk in my own little world. This is real place of course, but not part of my normal daily reality. It is a place that seems to be a significant ‘other place’ for me. It is another separate world in which I can exist but not really a place in which I live. The wind in the scots pines above me is soothing and with a padded shirt, coat, scarf and gloves I feel fairly cosy. I am dry and so is the bench upon which I sit so I am not getting damp and cold. I expect the temperature will soon drop when the sun dips below the horizon. When I head back down the hill I find I am bouncing along quite merrily. It’s like I have regained something of who I feel I would really be if I didn’t sit in front of a computer all day.